Tiger Bill Reviews Stick n Skins A photography book about the world of drumming by Jules Follett. 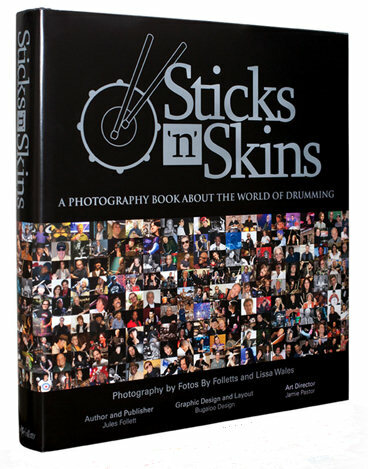 I was performing at Rock Con 2010 when I came across the Sticks 'n' Skins booth and was amazed by what I saw - A big, beautiful coffee table-sized book featuring photographs of drummers! Very cool! First off, this book is huge and heavy. It contains over 550 pages with over 500 photographs of drummers from the past and present categorized into four chapters. Jules Follett, author and principal photographer of this book, refers to the late, great drum photographer Lissa Wales as a "trailblazer" who would have been "the first to be published in book form if you had been on earth longer." The remainder of this section features Lissa's photos of the world's most famous drummers from Carter Beauford to Tony Williams. This section contains group photos of drummers taken at various major drum events. This is the main section of the book, which consists of individual photos of drummers from A to Z taken by Jules Follett and her team of photographers during their travels to more than 53 cities. Jules says "I have been privileged and blessed to have met and photographed this amazing group of musicians, THE DRUMMERS!" Along with each photo, Jules lets each drummer tell his or her story lending some personal insight to each featured musician. This brief section concludes the book with photos of some of the major players in the world of percussion, along with a notation from Jules who says she would like to share the full story of percussion in the future. Sounds like volume two is in the works. Cool! What can I say? This book is close to perfect. If I could offer Jules my feedback for improvement of a revised edition, it would be to be more selective in the inclusion of drummers in the main section. Some drummers who appear in this section have barely even started to pay their dues while those who have dedicated decades of their lives to the business are not represented. Aside from that, I love this book! The book provides a beautiful and unique look into the drum community through photographs and quotes that serve to explain to other musicians and non-musicians alike, exactly why we drumheads consistently do what we do even when we sometimes get little pay or recognition for it. I like to leave mine out on the coffee table as a conversation piece to impress other musicians who like to diss drummers! Things are looking up in the drum world. First we got to be on the cover of a real magazine and now we get to have our own coffee table book. How classy is that? Next we'll have a drummer for President. Hey, he or she would definitely get my vote! I suggest you pick up a copy of this beautiful book and place it where it belongs, out in plain view for everyone to see. It's about time that drummers "got some." Respect, that is! Thanks to dedicated photographers like Jules Follett and the legacy left behind by the late Lissa Wales, drumheads who have dedicated their lives to drumming will never be forgotten. This is one book that every drummer must own.